When patients visit Manhattan Orthopedic Care, our primary goal is to make sure they feel comfortable, taken care of, and that their stay is stress-free. We accomplish this by providing complete and detailed information about their injuries, the appropriate surgical procedures, and the paths to full recovery. We strive to provide the utmost orthopedic care that will help patients heal as quickly and smoothly as possible. Kevin Kischuk visited Manhattan Orthopedic Care with a serious shoulder injury. He had a torn labrum in his shoulder, which caused unbearable discomfort. In his search for an orthopedic surgeon, he picked Dr. Armin Tehrany and his team because of the comprehensive, warmhearted care he was given at his first appointment with our team. 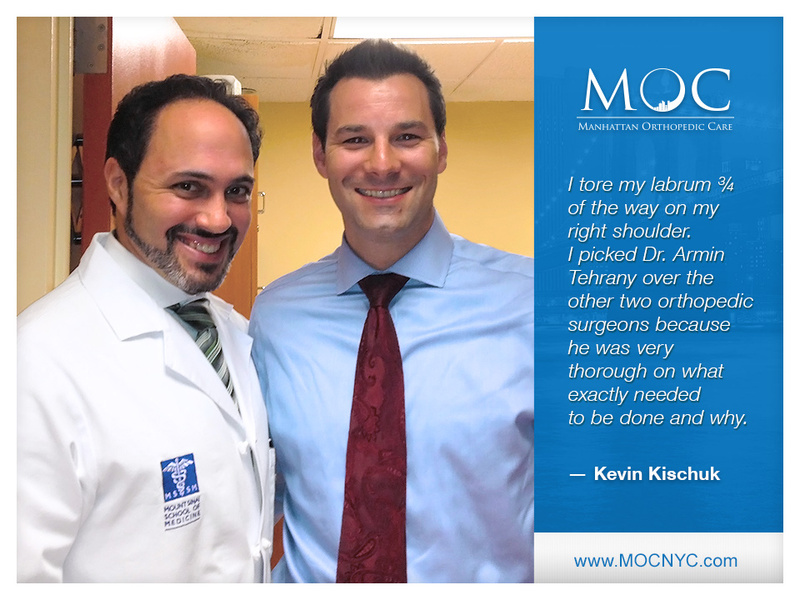 From the very start, it was clear to Kevin that he needed a glenoid labrum tear surgery. After the glenoid labrum tear surgery and the recovery process, Kevin started feeling even better than before he injured his shoulder. The soreness was gone, he felt strong and his movements went back to normal. Thank you, Kevin, for your trust!